While much of the nation contended with intemperate winter weather, folks were in shirt sleeves and the doors were wide open at Hanger 6, Gillespie Field, home of Air Group One, Commemorative Air Force this sunny Saturday morning. The Commemorative Air Force was established to preserve aircraft from World War II and now has more than 170 aircraft nationwide, according to Air Group One Wing Leader Doug English. Tables and chairs were set up in the hanger for their monthly BBQ, taking up the middle of the available floor space. Around the perimeter hang artists’ renditions of World War II aircraft in combat, plus displays of uniforms and equipment from the era. Prominent on its stand off to one side of the deck was an M-2 .50 caliber machine gun, like the ones with which Army Air Corps (forefather of today’s U. S. Air Force) bombers were armed. English explained that this non-profit hosts a monthly BBQ, which usually includes a presentation. For example, at their 24 February BBQ, two Tuskegee will speak. 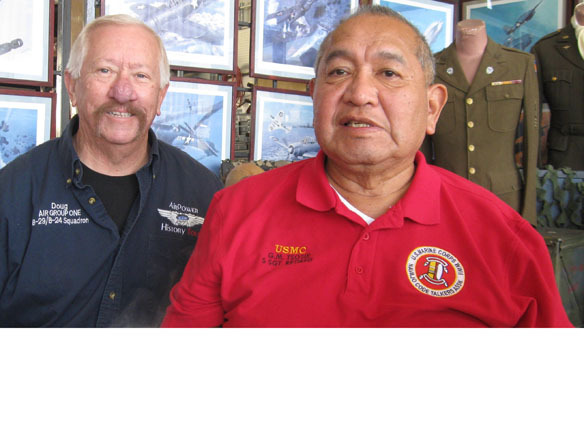 This day’s topic was the Navajo Code Talkers of World War II, presented by Mike Tsosie, Gunnery Sergeant (Gunny), U. S. Marine Corps (Retired) and son of Sam Tsosie Sr, one of the original Code Talkers. Tsosie Sr. passed away in 2014. Before the activities began, I spoke with Gunny Tsosie. When asked why he had joined the Marine Corps, following in his father’s footsteps, Tsosie explained, “Its something we end up doing. On the Navajo Reservation, military service was the only way out of there.” He served two years in Vietnam, finishing up in the Persian Gulf. He proclaimed the Marine Corps “gave me my life. It made me stronger and a little wiser about living, if you don’t mind me saying it this way, in the white world.” He went on speaking of making friends in the Corps, with some of whom he still maintains contact. In military retirement, he returned to the reservation and was the maintenance man for a new boarding school, eventually becoming a fire captain before finally fully retiring. One nugget of information he shared was that, due to exceptional secrecy about the Code Talkers, he did not find out about his father and his fellow Marines until he had retired from active duty. Thanking the Gunny for his time and telling him I looked forward to his presentation, I made my way out of the hanger, where dozens of clean cut, fit young people were (smartly) milling about. Being an astute observer of my surroundings, from their logoed polo shirts I discerned they were Air Force ROTC cadets from San Diego State University and Navy ROTC midshipmen from the University of San Diego. Speaking with four of them I took an informal survey, asking their motivation for joining the Air Force ROTC. All four gave a version of “wanting to serve.” More or less the stock answer. When pressed, the smiles came out as their expressed the keen desire to fly. And, one explained, it is cheaper to have the military pay to train them to fly than it is for mom and dad to foot the bill. Honesty! It came out that Air Group One has a training initiative with the SDSU Air Force ROTC, which explained their presence at this event. Those gathered made their way back to hanger, where it was announced lunch was served and would be followed by the Code Talker presentation. Gunny Tsosie provided introductory comments, informing us that the program started because of Phil Johnson, who had been raised on a Navajo reservation, where he learned to speak Navajo. According to some research, Johnson approached the Marine Corps with the idea of using the Navajos as communicators, convinced the Japanese could not decipher what they were saying over radio. As Tsosie explained and demonstrated, the Navajo language is very complex. The Marine Corps embraced the concept and the Marine Corps Navajo Code Talker program began, with Code Talkers fighting in all the Pacific Island campaigns. With no small amount of obvious pride, Tsosie declared that the Navajo Code has never been broken. Then a video of Sam Tsosie, an fascinating oral history if you will, was started. We learned the Navajo Code Talkers were all Marines, and how Tsosie became a Marine was interesting. He had attempted to join the military right after the bombing of Pearl Harbor, but was too young. He became a member of the California State Guard, but soon bored with the routine of guard duty. So, he took another crack at the Marines, after forging his mother’s signature on the enlistment paperwork, and along with 28 others, tried to join. Only six of the twenty-nine passed the initial physical, with only two passing the final physical. As one of the two, he headed off to boot camp at Marine Corps Recruit Depot San Diego. Tsosie had been advised to go into the radio communications military occupation specialty, which led to him heading to the secret Code Talker school after completing boot camp. There, all these new Navajo Marines had to pass rigorous Navajo and English proficiency tests to continue with the training. Those who did not meet the requirements were “assigned to the grunts,” according to Tsosie Sr.
After their training, they shipped out in June of 1943. He recalled landing in Melbourne, Australia on 4 July 1943. More field training, using their special 200 plus code word vocabulary followed. In November 1943 Tsosie and his fellow Marines shipped out for the landings in New Guinea. He spoke of their combat patrols and missions—like taking an airfield. During the overland march to that objective, one of his fellow communicators dropped the portable generator. When, after reaching their assigned position, it was discovered the generator was missing, Tsosie and fellow communicator, plus six other Marines, were sent back to recover the generator. He continued to relate combat experiences against the Japanese, including coming under machine gun fire and aerial bombardment. One mission—to take a Japanese pillbox that served as a major communications facility. As history tells us, the Marines were successful and secured their objectives, like Bougainville. Smiling at a humorous memory, Tsosie Sr. related that they always had to wear their helmets, even after combat ended, because coconuts would fall from the trees and conk the Marines on the head. Volunteers all, the Navajo Code Talkers developed their own code, using their native language. During the war, some met in Hawaii to update their codes, to be more effective. Those who attended this meeting then went back to their units and trained their fellow Code Talkers. For example, the Navajo word for buzzard was used for bomber. The Code Talkers proved their value time and time again, in battle after battle, as the Marines conducted the island-hopping campaign across the Pacific. The Navajo Code Talker Marines excelled in every battle, including the battle for Iwo Jima. According to the “Navajo Code Talkers: World War II Fact Sheet” from the Naval Historical Center, Marine Corps Major Howard Connor, signal officer for the 5th Marine Division stated, “Were it not for the Navajos, the Marines would never have taken Iwo Jima.” Tsosie Sr., speaking in the filmed oral history, explained just how important it was when the American flag was raised on Mount Suribachi, boosting everyone’s morale. Joe Rosenthal captured the raising of the flag in the now iconic photograph. Taken February 23, 1945, it is arguably the greatest combat photo ever taken. After the war, some of the Code Talkers stayed in uniform and served on occupation duty in Japan and China. But their unique contributions remained secret until 1968, when the program was declassified. It was not until President Reagan declared 14 August 1982 as Navajo Code Talker Day and awarded the Code Talkers Certificates of Recognition that the greater nation learned of the exploits of these brave Marines. On 21 December 2000, President Clinton signed a law awarding the Congressional Gold Medal to the original 29 Code Talkers and Congressional Silver Medals to the remaining individuals. Later, President Bush signed into law the awarding the Congressional Gold Medal of every Code Talker not already so recognized. Long overdue recognition.